Saiprayas.org - A Step Towards Sai..
Dear Friends: Saiprayas is an online spiritual incarnation of almighty Sai Baba to come in the lives of more and more people.Once you visit this and roam from one page to another , you will certainly feel his presence. Saiprayas.org offers you opportunity to gather online, to connect with the Supreme Lord with greater energy. Our personal experience with saibaba has compelled us to spread his glory among all possible. Sai Devotees will agree that they eagerly seek opportunities to share their experience with baba as it gives them chance to live that moment of being blessed again and again.It is a great joy for us to offer you a platform to share, explore, serve, grow and go. We humbly invite you to share your experiences with almighty Shri Sai Nath. So Lets Start and Be Part of Saiprayas Family. Very Nice topic indeed. In my case Sai Knew me first before i could know and realise Him. My sis.in.law gifted me a SSC in March last year; till then i did not know Sai though He is There just behind my house in Hyderabad. I used to go to the mandir rarely. Then last year when i got SSC i started reading it immediately... it was English version and i kept reading it everyday a Chapter though. I have immense faith and have felt presence of my dear Lord Jesus since 1995 and i knew a little what is Faith actually by attending Prayers. Reading through Sai's Charitam i can see the love of GOD and Sai starting pulling me to Him. I started with attending Thursday Night arti's and now i am trying to attend 2 artis minimum everyday... He is Omnipresent and Kind and Strengthens us somehow even in crisis.... Pray that we should keep Loving Him more and more in any situation, and that seek His Strength to live with His Presence in patience. I had my neighbour Mrs padmavathi whom I use to call Akka . I went to their home and I was just chatting with their family. Suddenly akka asked me why I am looking so dull today then I explained her nightt I had severe asthma and I suffered a lot . Then she gave me Baba's Vibuthi and she told me to read sai chartitra One week after wards I have to send 11 rupees to Shirdi. I did the same way as Akka explained . So from that day on wards I became devotee of sai Baba. It's wonderful to read how various devotees met Sai for the first time. Here is my encounter. My parents are orthodox and always worship all Gods and do puja/abhishekam etc every day. When we were young, they had pics of Shiva, Vishnu, Lakshminarasimha, Balaji etc, no gods were eliminated in our puja room, including Sathya Sai of Puttaparthi and Shirdi Sai of course. I had seen the Shirdi Sai pic as a young girl, my parents had even visited Shirdi at some point but I knew nothing about Shirdi Sai. After I grew up and got married etc, I also set up a puja room and some time in 1986 when I visited India, I bought a picture of Shirdi Sai in Mantralayam. I had kept that in my puja room but never paid special attention to it. Much later in 2001, I was faced with a major health scare totally unexpectedly, despite being very healthy all my life. I was praying in my puja room every day and one Friday night, all of a sudden, I saw that Sai photo where he is standing in a red robe and showing his blessing right hand and I quietly said "Oh Sai, I am praying to all the Gods but I know absolutely no prayer for you. All I can do is pranam" and I did that and went to bed. Next day (Saturday), I picked up mail and I saw an envelope from Sai temple in Pittsburgh. We had visited that temple when my in-laws had come that year and we had taken them to Balaji temple in Pittsburgh. Since Sai temple was also not far from there, we had visited but I don't remember much about that visit. When I saw the envelope in the mail, I opened and it was the newsletter. But the miracle was that the last page of the newsletter had 108 Sai Namavali! I still get chills thinking about it since just the night before, I had said to Sai that I knew no prayers specific for Sai and here I had this in my hand. I started chanting it. A few years later, I had the good fortune of visiting Shirdi for the first time ever (my only visit so far unfortunately) and bought Sai Satcharita and it is my favorite holy book. I didn't want the original Sai Namavali paper to tear as it was getting old after being handled with my hands for more than 10 yrs now. So I got it laminated (that was Baba's idea too as I didn't know how to protect that paper at first and I feel it's safe now). Around the same time as Sai coming into my life, somehow my husband was also attracted to Sai all of a sudden, this despite my husband not being the religious type. Now we both are Sai devotees and our son also believes/prays to Sai. I introduce "Sai" into many of the other prayers. I feel now that despite all the pics of all gods in my puja room, I am always fixated on Sai photos and he is my only God. He responds to us like no other. He communicates with us like no other, I feel like he is really a person right next to me. I am so grateful to Sai forever for allowing us to be his devotees, for calling us to his darbar and always being there with us. Since we met Sai, I have had countless miracles/experiences and it's a reminder that Sai is always with us whenever, wherever we think of him. May he always protect us with his blessings and give us health and happiness. I wish the same for all devotees. Jai Sairam! Baba blessings. It is very nice to read your Sai experience and how you got into Sai's fold. Even I have been to Pittsburgh Saibaba madir and now it is so big and wonderful to spend time in the temple. Baba bless you in everyway. The story of how Babaji pulled me to Him is probably a little different from most of my fellow devotees here in that I am a Caucasian American... I started following the Vaishnava path about 2 years ago and LOVE Lord Vishnu and all of His forms especially Lord Krishna and Lord Nrshimhadeva!! Shri Sachidanand Sadguru Sainath Maharaj Ki Jai!! I used to go to sai baba temple every Thursday as a child, but I never really knew about him that much. My brother would go, and I would go with him. When I was in undergrad, I came to know about sai baba through a few friends. They gave me sat charita, took me to sai temples and explained how sai is a constant presence in their life. In 1997, I attended a yoga program. When I started practicing it at home, I started feeling the need to have a guru. I had read about Kanchi Paramacharya, Shirdi Saibaba and Ragavendrar and I had high respect for them. I had darshan of Kanchi Paramacharya many times in Kanchipuram. 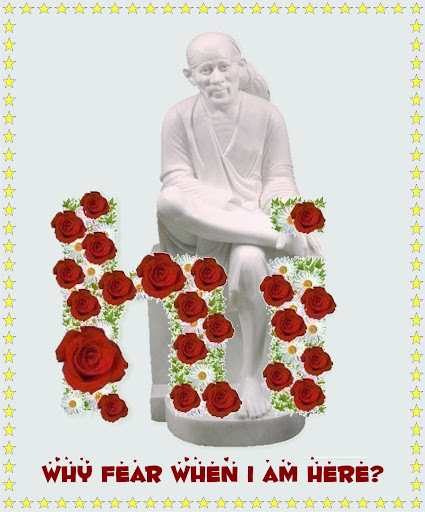 Whenever I saw a picture of Shirdi Sai, I felt that he resembled Kanchi Paramacharya. I felt like following Shirdi Sai and hence I started worshipping him since then. See how different these experiences are , from each other.... its great!!!! Page created in 0.306 seconds with 55 queries.